Kayakpak I goes right into your Kayak’s tank well, and if you’re an avid kayak angler, just starting kayak fishing, or an experienced professional guide, we’ve built Kayakpak I with you in mind. Outside front has sewn-in a tough & adjustable fishing rod/tool holder array with (2) rod & reel tubes included. Single tool holders on sides, along with (2) covered pouches. Unique top cover has a clear plastic map pocket on its exterior side, a mesh fabric interior compartment, and can be rolled away. Backside, there’s a slit pocket. Multiple grommet drainage holes are everywhere to help protect your gear from water damage. And several exterior ‘D-Rings’ allow for additional lanyard tools attachment and cord lashing of Kayakpak I. Made of sturdy 600D water resistant ripstop fabric throughout, fully padded and interior lined, we believe you’ll find Kayakpak I essential for all your angling experiences. 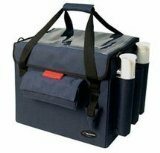 Includes integral carry strap plus adjustable/detachable padded shoulder strap. This entry was posted in Kajak Fishing and tagged Angling, Fishing, fishing-rod, Kayak Fishing, product-description, Rod Reel, Tubes on April 27, 2011 by .